Everything I have ever done in my career (and life) could demonstrate progress (uh, sometimes). For example, when I was rating credit portfolios in commercial banking there was a beginning (prep), middle (doing the review) and end (communicating the results to the poor lending executives). When I was building software there was a beginning (planning), middle (building & testing), and end (releasing to users). Going from current state, to future state is the progress achieved when getting a job done. Jobs are jobs; things we must accomplish in our careers or lives. They are not how we do the jobs (the current state for a specific solution) to reach our objectives. Facebook is not MySpace, it’s Facebook. Planets are not comets, they’re planets. Walden Pond is, well, nevermind. Jobs are not activities. Nor are they progress. Progress is how we measure the success of jobs. The first time I saw a depiction of progress around Jobs to be Done it was focused on the customer making themselves better somehow. It used a depiction of Super Mario jumping over a plant and becoming bigger and more powerful. 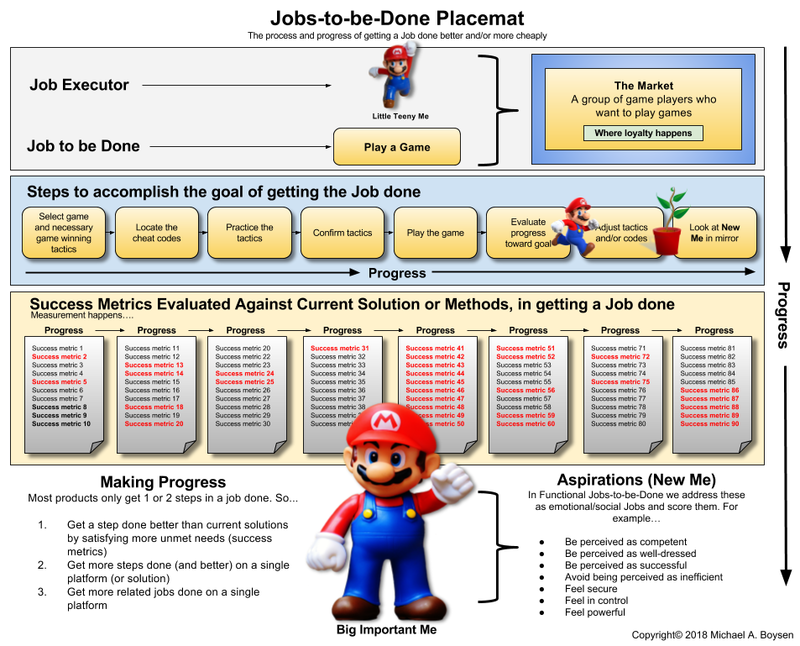 I decided to use that to create a placemat describing progress using Jobs as Jobs Theory. 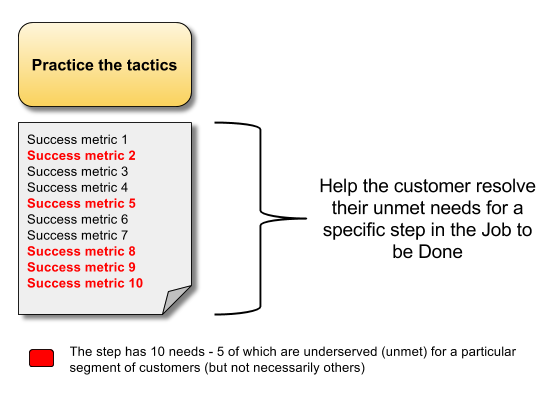 The first lens that I’ll apply to progress is when a solution emerges that helps a segment of customers get a single step in their job to be done done better and/or more cheaply. When you look at most solutions today, and you apply the lens of the job to be done, they generally only get one, or a few steps done. So, as a solution provider, the first place you can look to help your existing customers get the job done better, is simply to help them get a step done better. This approach probably won’t help solution providers grow their business, it’s more of a sustaining approach. In the absence of solutions that get more of the job done (for whatever reason), this is better than nothing. The second lens we can apply to progress is when a solution emerges that helps a segment of customers get more steps done. Instead of having to cobble together various solutions, the person trying to get the job done can do more with a single solution. For the solution provider, growth is the equivalent of progress. To achieve that growth, they need to help their customers get more of the job done. The third lens we can apply to progress is when a solution emerges that helps helps people get many related jobs done on a single platform. Instead of having to cobble together various solutions, customers now have the option of purchasing, or subscribing to a platform that helps them get many jobs done. An example would be the smartphone platform. While the original context was “on the go” many of us use them at home as well. Things like making phone calls (replaces a landline phone), listening to music (replaces stereos and portable music players), Messaging with others (replaces computer-based chat and in-real-world conversations), taking pictures (replaces clunky cameras). Even paying bills! 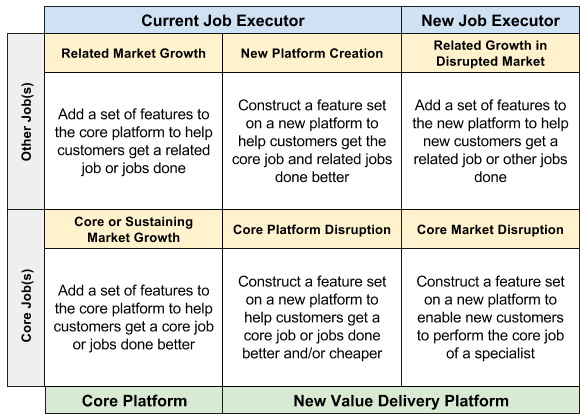 Does the platform have to get all of the jobs done better? No, not initially. 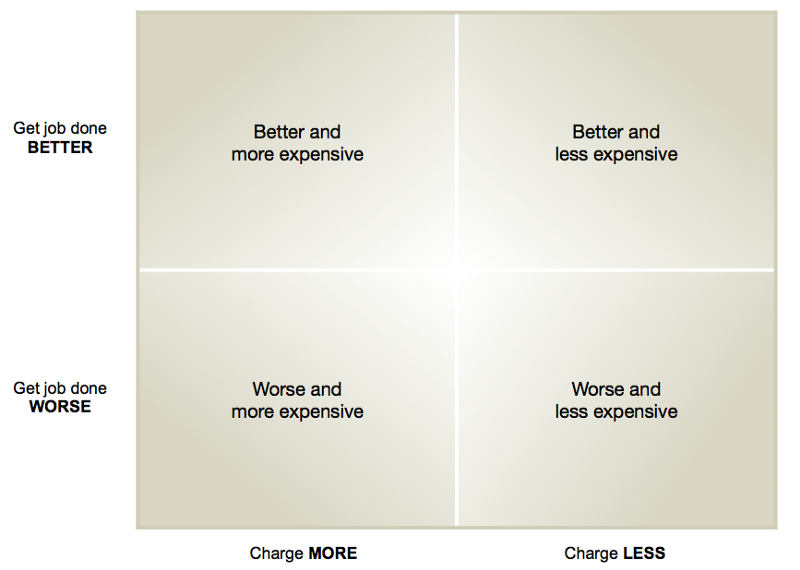 It reduces overall cost and increases convenience enough to disrupt the other solutions. In many cases, we can do things we couldn’t do before (like lay in bed playing games all day). Here’s another interesting way to view progress through action. 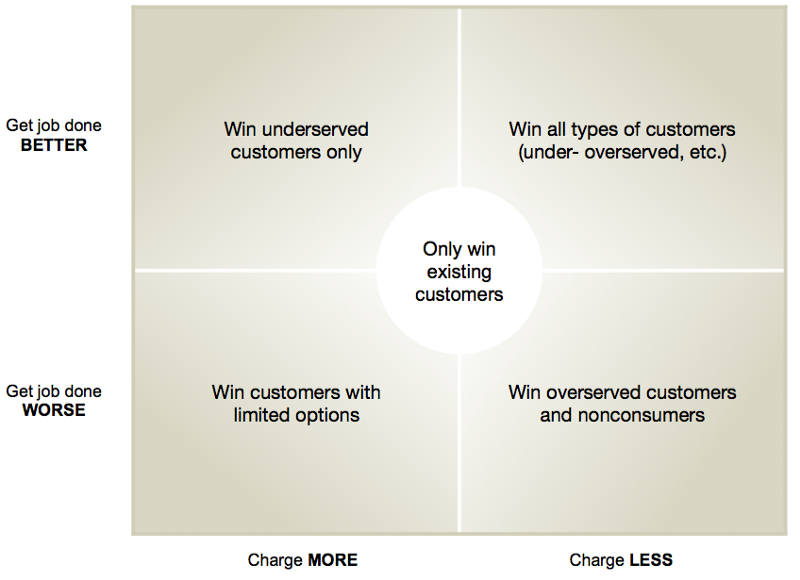 This matrix describes how to introduce growth as a solution provider by helping customers make progress — getting more done better and/or cheaper. 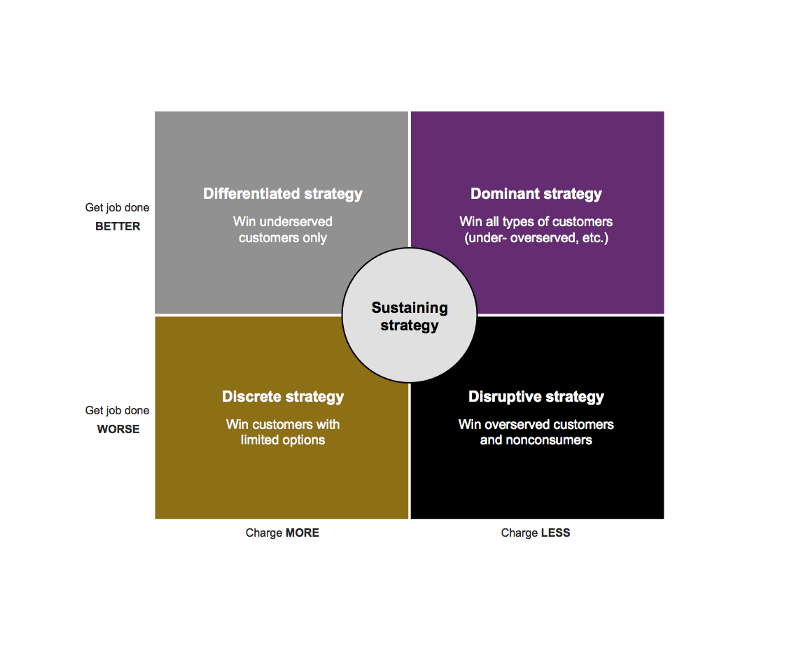 Strategyn has published a very well-knit theory around Jobs-to-be-Done growth strategies. Yes, these are solution provider strategies. However, using the Jobs-to-be-Done lens they happen only because they are helping customers get jobs done better and/or more cheaply. Everything highlighted here is designed to describe progress in ways that can actually be used to design a discrete product, or platform, for a market. If you were to focus your innovation efforts around pie-in-the sky aspirations and hopes, you will never be able to predict success. As noted above, they are often hidden, complex and not even entirely conscious. Marketers have tried forever to uncover “ah ha” moments in the buying journey to create short term progress in revenue generation. Long-term progress requires that we view the actual Jobs-to-be-Done (not purchase journeys), and view them as singular and observable, with discoverable drivers (desired outcome metrics), and not as lofty, mushy self-betterment ideals. The Three Levels of Progress in Jobs Theory was originally published in Transform Customer Experience using Jobs-to-be-Done on Medium, where people are continuing the conversation by highlighting and responding to this story.